The King of the cheeses with hundreds of different uses. DOP* certified. Considered by some to be the greatest cheese on earth, the King of Italian cheeses has a rich, nutty yet delicate flavour, and real Parmigiano-Reggiano is so much more than just your ordinary table condiment. From the middle ages to present day, this delicious cheese owns its title, and must meet certain requirements to earn its name. It can only be made in a specific designated region of Italy, from high quality pastures and milk, produced using the same artisanal methods that have remained unchanged for seven centuries. Its natural aging process and the complete absence of preservatives, additives or colouring agents help to place Parmigiano as undeniably one of the world's greatest cheeses. 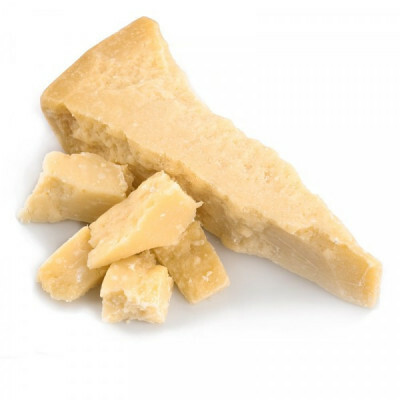 Grana means grainy, which explains Parmigiano's unrivalled texture, which can be eaten hundreds of different ways. Nibble of delicious chunks of it alone, or perhaps drizzled with balsamic vinegar, grate over a carpaccio, or eat for dessert with pears. Its texture and flavour can also be included in risottos, pastas and salads, making real, good quality Italian Parmigiano the perfect kitchen investment. Cow's Milk, Salt, Rennet. Cow's MILK.